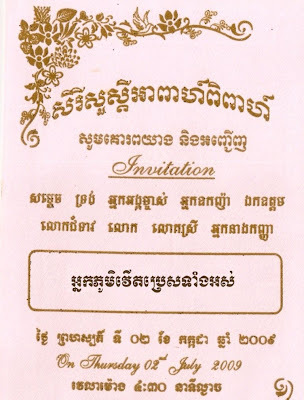 This entry was posted in My Wedding, Uncategorized, ព៌ត័មានពីខ្ញុំ. Bookmark the permalink. Hey Dith! So sorry I could not make it to join the wedding ceremony but here from distance I love to wish you guys a happy life forever and after! 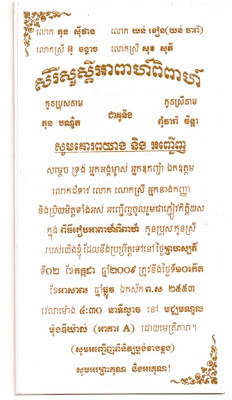 ម៉វិញយូរហើយហ្នឹង តែគ្រាន់តែមិនទាន់មានពេលផស់រូបថ្មីៗ ព្រោះ Day off ដល់ទៅម៉ាអាទិត្យមកវិញការងារ​គរដូចភ្នំសំរាម…..